For pricing & information, click on one of the decorative or shutter mounting hardware categories below! Extensive selection of window shutter hardware for all your exterior shutter hardware needs! There are many advantages gained by mounting your shutters on exterior shutter hinges. Hinged shutters will enhance the facade of any structure by projecting the shutter off the house, giving the structure a 3-D effect, as opposed to shutters that are fastened against a structure and appear flat without the desired shadowing. 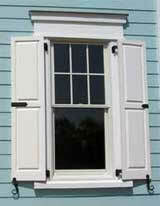 In addition, it is preferred to mount shutters on hardware for breath-ability. The space between the structure and the shutter allows air movement, keeping the shutter and your siding drier by removing trapped moisture that may occur when nailing or screwing them to the structure. Hanging your shutters on the proper hardware will make installation and caring for them easy and efficient. Simply lift the shutter off the pintels and refinish or store them in the garage during time of the year that you may not want them on the house. Often shutters nailed or screwed to a structure are damaged when removed or are not removed and only finished on the front side which will not protect your shutters and you will be replacing them before their useful life should have been over. Easy removal of the hinge mounted shutters without damage, and the ability to easily refinish all six sides will ensure your shutters last a lifetime. In addition to the exterior shutters you choose for your windows, they will most likely need the additional support of appropriate hardware to go with them. Larson Shutter Company features several brands of exterior shutter hardware that will make your shutters functional or decorative. The unique shapes and functions of our exterior shutter hardware pieces make finding the right item to match the corresponding shutter function essential for proper operation and installation and easy process. As an added benefit of using the different hinge options and hardware that are available is, it will make setup and removal easier and also reduce the chance that they will be damaged later. Even if you do not forsee needing to open and shut your shutters you can enjoy the benefits of functional shutter latches and other hardware. There are the five different categories of exterior shutter hardware available in our store. Each one contains its own particular styles and specifications, allowing you to customize your window shutter project with decorative or functional operation. Atlantic Stainless Steel: Find the appropriate amount of hinges for each window shutter you use, and install strap hinges, L hinges or others that allow you to open and close the window easily from inside the home. Lynn Cove Foundry and Forge: These are handmade stainless steel or carbon steel additions that are designed to be both affordable and functional. Some of the shutter stays we include are featured in specific shapes, such as a rat tail or a dolphin, which could add a degree of personality to your house's exterior. Coastal Bronze: This may appear to be a rather expensive hardware collection however if fine items that will last is your thing you have to adorn your shutters with this hardware. This bronze hardware collection was created to provide a reliable source for solid bronze shutter and gate hardware in rustic old world designs for coastal areas and rustic settings. The coastal Bronze hardware is of old traditional designs that have been around for hundreds of years and you can expect this to last more than your lifetime and remain rust free. Seaside Shutter Hardware: This brass hardware is a more cost effective choice than the bronze collection, however you will never have to worry about rust since brass does not rust. Seaside Brass Hardware is great looking and comes in a black finish standard but is available in several other optional choices including: Oil Rubbed Bronze, Antique Brass, Satin Nickel, Polished Brass or Un-Lacquered Brass. Decorative Non-Functional Hardware for Vinyl Shutters: A variety of screws, fasteners, S-hooks and clips can be found here, including Shutter-Lok fasteners that are compatible with Mid-America Vinyl Shutters. The correct hardware choice can be intimidating because of the complexity when you are not used to working with it. If you need help choosing your hardware give us a call at: 1-800-675-6555.